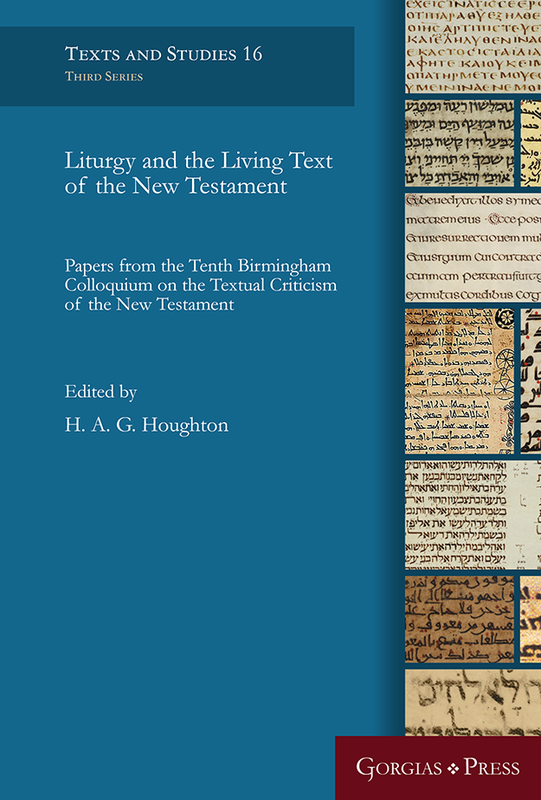 Gorgias Press has just released the latest volume of papers from the Birmingham Colloquium on the Textual Criticism of the New Testament with the title Liturgy and the Living Text of the New Testament. To help get the word out, Gorgias has offered to give away a free copy to one of our lucky blog readers. Enter to win by any of the means listed at the bottom of this post. Description: The textual history of the New Testament is a dynamic tradition, reflecting differing readings, interpretations and uses of its canonical writings. Twenty years after the publication of D.C. Parker’s celebrated volume The Living Text of the Gospels, the papers in this collection provide further insight into the lives of the New Testament text. 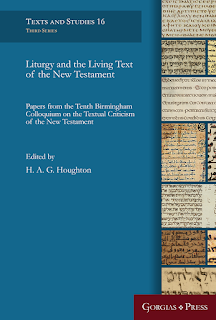 One especially important focus for the New Testament as “living text” is its use in Christian worship: individual chapters examine the importance of liturgical manuscripts in Coptic and Greek traditions, alongside consideration of broader themes related to the lectionary text. Several famous biblical passages are the subject of extended treatment, including the Pericope Adulterae, Jesus’ teaching on the Temple in Mark, and the Lukan genealogy. The contributions represent original research by an international range of scholars, first presented at the Tenth Birmingham Colloquium on the Textual Criticism of the New Testament. Update: Congrats to Jeff C. for winning! I've been seeing updates about this one on Twitter. My fingers are crossed for the giveaway! I seem to have been having problems leaving a comment, and as for the question you asked, when did I first read Parker's Living Text book, I'm struggling to remember. I would have said either the end of the nineties, or the start of the noughties. I just read Parker's book. I somehow recall the comment of my professor: this book is primarily a theological book and, secondarily, a book on NT textual criticism. During my Masters. A stretching and thought-provoking read! I have the same problem as Peter Malik. Sadly, I have only read Parker's Intro to NT MSS and Their Texts...but loved that! I read it when it first came out, and while there is much to question, I thought, and still think that it is probably the most stimulating book on the NT text that I have read. I came upon this while looking at materials on CBGM! I hope I win! Interestingly, Parker's book pointed me to my dissertation topic. When a text critic says a manuscript has a regrettably sparse bibliography, I pay attention!